There are various ways you can merge cells in Excel. One of the most used ways is using the Merge & Center option in the Home tab. If I select cell A1 and B1 and use the Merge & Center option, it will keep the text from the leftmost cell (A1 in this case) and remove the text from all other cells. Excel is not completely ruthless though – it warns you before this happens. If you try and merge cells which have text in it, it shows a warning pop-up letting you know of this (as shown below). Here we are combining the cells A1 and B1 and have a space character as the separator. If you don’t want any separator, you can simply leave it out and use the formula =CONCATENATE(A1,B1). Alternatively, you can use any other separator such as comma or semi-colon. This result of the CONCATENATE function is in a different cell (in C1). So you may want to copy it (as values) in the cell which you wanted to merge. If you want to merge cells in different columns in a single row, here is an alternative of Merge & Center – the Center Across Selection option. Press Control + 1 to open the format cells dialogue box. 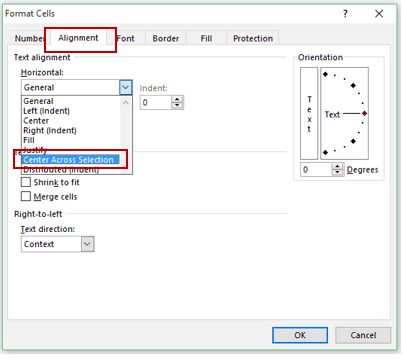 In the Alignment tab, in the Horizontal drop-down, select Center Across Selection. This would merge the cells in a way that whatever you enter in the left most cell gets centered, however, you can still select each cell individually. This also does not show an error when you try and sort the data. NOTE: For Center to Across to work, make sure only the left most cell has data. I AM TRYING TO MERGE AREA CODES FROM ONE COLUMN AND PHONE NUMBER IN ANOTHER AND THEN BE ABLE TO DELETE THE TWO COLUMNS I DONT NEED ! HOW DO I SAVE TH INFORMATION IN CELL 3? I’m a beginner in Concatenate formula. I need a help to make a line break or change line when concatenate the two cells. Like put the content of the cells not to side by side, but above/under inside the same cell. There is a way to do that? This is just brilliant! Too good! Going to use this everyday now! what is this “video like” screenshot called and also how to make it? The Center Across Selection button/icon can be directly added to the QAT. QAT – (click drop down) select More Commands – Choose Commands from: All Commands – scroll to Center (Not Merge) Across Selection. Select and add to your QAT. Thanks for dropping by and commenting.. The Center Icon from the list would centre the content in the cells but would not Center Across Selection. Unfortunately, there is no option in that list that can do that. The only way is to create a macro and add it in QAT. Excel 2010 (ver 14.0, 64 bit). In my Customize QAT, there is Center (that you refer to) and right below it, I have “Center (Not Merge) Across Selection”. It does exactly that. What if I would like to merge cells in different rows in a single column? Thanks for commenting Izabela.. In case of rows, there is no other way. You need to use Merge & Center. The drawback is that it will keep the content of the top cell only. Thank you! I love your articles! They are so useful! I wish the same. The only option I can think of is to write a macro and have it in the QAT.